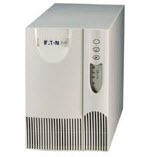 Powerware 5125 (PW5125) is an Uninterruptible Power System by Eaton. Designed to ensure that clean power is supplied to all kinds of IT devices in the network system and assure their reliable operation, Powerware 5125 protects your equipment against five of the nine most common power problems that can harm your equipment or result in corrupted data. The PW5125 offers the features needed for cost effective network protection and comes with the proven reliability users have come to expect from Powerware products. In addition to a reliable shutdown solution, Powerware 5125 offers extended runtime capability as well as enhanced connectivity options to manage and monitor the UPS remotely. This unit is compatible with ConnectUPS Web/SNMP network adapters. ConnectUPS Web/SNMP network adapters are the most powerful and flexible way to manage and monitor UPSs in a computer network environment. Web interface shows current status of the UPS at a glance, while also storing data in its memory for future reference. If ConnectUPS Web/SNMP network adapter is installed in the system then you can use optional Environmental Monitoring Probe (EMP) which provides temperature and humidity sensors as well as two relay inputs which can be used to detect intrusions, water leaks, smoke and fire alarms. As a bonus, status and environmental data from the UPS unit and its Environmental Monitoring Probe can also be read by the iMCA System thereby saving you the need to invest in other environmental sensors with the same parameters as EMP. When integrated with the iMCA System, you can not only remotely monitor ambient and UPS's internal temperature/humidity but also create virtual connections with any switching and sensing devices registered in the iMCA System such as static, pulse, IR, security arm or disarm etc. You can easily create and execute any number of automation scenarios based on sensor information from this unit (including state of UPS), without having to deal with any cryptic codes or learning a scripting language. With this device together with the iMCA System you can affordably build effective Climate Control solutions and receive alert notifications via email and SMS when desired environmental thresholds are exceeded.